Notes: You’ve probably seen this one before – it seems like every blogger who makes their own clothes has given this pattern a go. 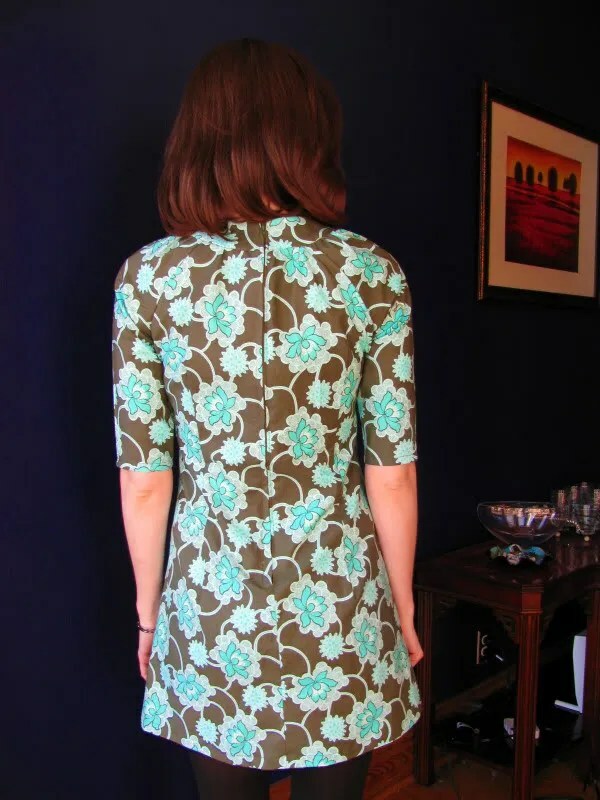 I can certainly see why – the pattern is very versatile, and contains 3 nice versions – version A is a dress with elbow length sleeves and pockets, Version B is a minidress with sleeve ties, and version C is a top with a gathered neckline rather than a collar. I made version b, the minidress. You will notice that my version does not have the cuffs or sleeve ties. I actually made them, but I felt really uncomfortable wearing them. I don’t know if you can tell in the photo above (which is from before I hemmed the dress) but the ties are really huge. It also seemed like they would come untied all the time, the length was awkward (elbow length) and (dealbreaker!) they make it impossible to wear a sweater over the dress. So I took them off and made a small hem. I’m much happier now – the length is perfect for me, just above the elbow. Keep in mind that I have freakishly long arms, and on most people this might hit lower. I thought I was choosing a size that was too small for me – the recommended size for my bust was a 12, but I thought it looked big so I made the 8. However, as it turns out, it’s not the pattern – it’s me. I had my measurements taken yesterday and found out that in fact I do not have a 33.5″ bust – I have a 31.5″ bust(lucky me, right?) I have no idea if I shrank or if my last set of measurements was inaccurate, but I insisted on retaking that measurement about 12 times before I just accepted it. 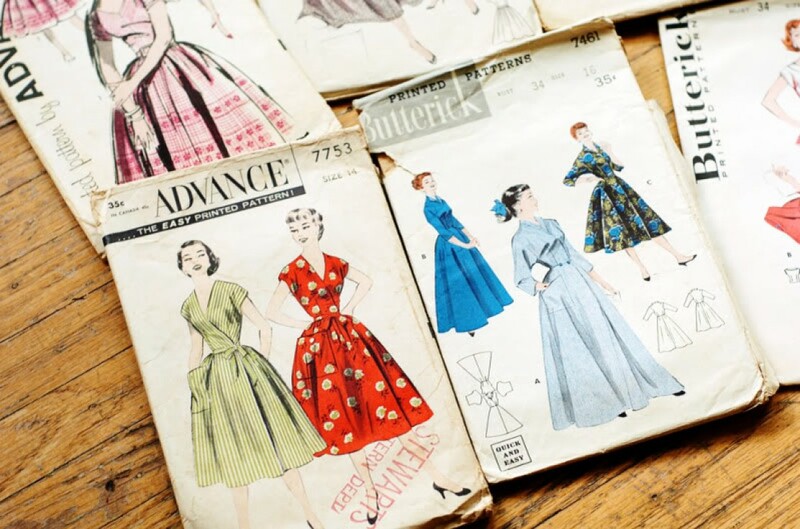 That does explain my puzzlement when trying to figure out why patterns fit me the way they do – I had worked up a muslin of the dress I showed in my last post and it was enormous – of course, it was a 34. 3 inches smaller and it might have fit. It also explained why I have such trouble with knitting patterns that start at a 34. I thought I had small shoulders – guess not (or maybe so, but that’s not the whole reason.) 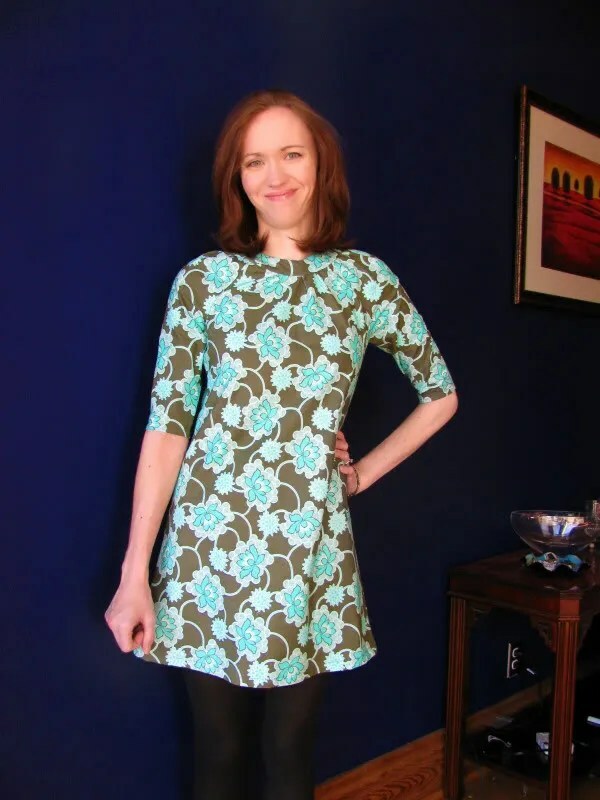 I then went through my closet and measured all my dresses – every single one that is not stretchy measures a max 34″ in the bust, and the knit ones are even smaller. New things learned with this pattern: gathering, hemming small diameter objects like sleeves, sewing on a collar. I used a trick I read online for the gathering. I did a zigzag stitch over a length of crochet thread and used that to draw up the fabric – much sturdier than threads, and faster too. I actually like the print, although there is a lot of it. I try to be careful with the scale of prints, so I hope this isn’t too overwhelming. Cotton is easy to work with, although I must confess that this sort of fabric isn’t my favorite to wear – I generally avoid cotton shirts and dresses, both because of wrinkling and because I don’t enjoy the crisp feeling. I doubt I’ll be making more dresses out of this, but I love it for quilts! So to sum up… many things learned, and a cute tunic – even my husband liked it! it turned out really cute! love the fabric. That is so cute!! I love it with the leggings. wow, that’s so pretty! the fabric is great, and it looks really chic with the leggings. Very very cute. I love the big pattern on this; it makes it a little retro, but still sophisticated. 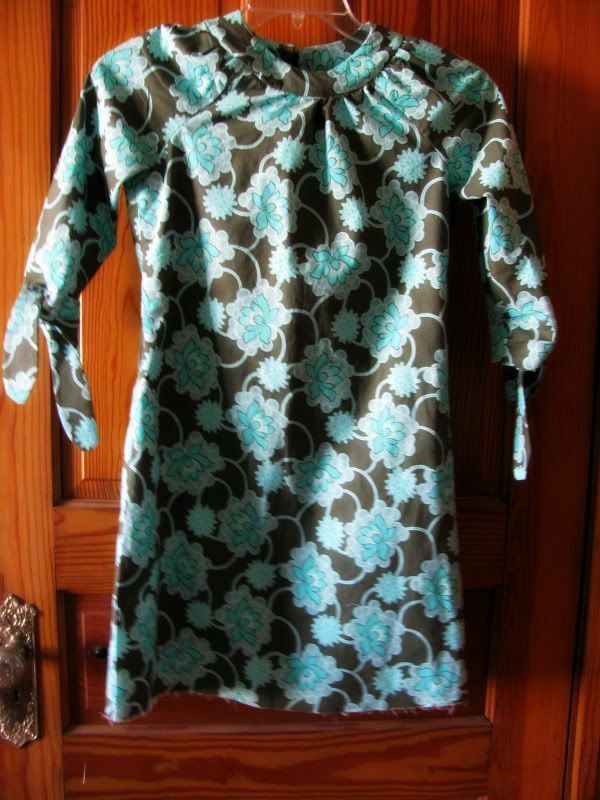 It’ll be super cute with a pair of longer shorts underneath in the spring, too, I bet! super cute! I might give it a try although it’s been YEARS since I’m sown a garment. So very cute! It looks great on you! Way cute! Love it with the flats and leggings especially! I have to say, that last photo is adorable. Love love love this! So cute with the leggings and flats. Love this and it looks great. Encourages me to get my act together and start sewing again. Cute cute! It looks like it fits great and it sounds like you are learning a lot. Great choice of fabric for this design – love it! Looks great!! Even if your full bust was 34, 12 might not have been the right size because of the pattern sizing/amount of ease included on that particular pattern. My full bust is 34.5 and I often sew the 10. It depends on the finished measurements of the pattern – that’s what I focus on – measuring finished garments that fit me well and choosing the pattern size that has those finished measurements. LOVE it! Totally retro cute! I must say that you are a heck of a cute redhead in that tunic! Especially that last photo. I love reading your blog and learning from it as well. This last week has been between zero and twenty degrees here in eastern Washington. I’ve been holed up knitting for family and really enjoying myself! Just little things–fingerless mitts, dishcloths, felted slippers. December is so cozy! So cute, I love the fabric choice (I’m such a sucker for Amy Butler… and in fact I have a shirt made of this same fabric, different colorway.) I jumped on the bandwagon and made a couple of these Built by Wendy tunics a while back, but had to admit the arms and collar were too tight for me–it’s nice that they fit you well as drafted. Super cute, love the print! Really cute outfit! You look really great!